Children of Syrian refugees in an improvised school in Jordan. Forty percent of refugee children from the Middle East are not educated. Photo: Freedom House, open source.Nura, 12, takes her belongings from her rucksack and lays them on the desk: a big, bright pink pencil-case emblazoned with the words “I’m CHIC”, a notebook, textbooks, and erasers. Nura always shares erasers with her neighbour Gufran, with whom she sits at the back desk in this classroom. On the next row sit two younger girls — another Nura and Soraya, who are best friends. The children slurp lollipops and freshly-picked plums as they take out trading cards. All of them are originally from Aleppo. The girls have turned up for a lesson at an integration centre in the town of Noginsk, just outside Moscow. It’s run by Civic Assistance, a human rights organisation that runs classes for the children of foreign citizens in Russia. The school itself comprises two classrooms in an office building. The walls are covered with posters of the alphabet, animals and household objects, as well as children’s drawings. Among them are samples of applications made to Russia’s Federal Migration Service (FMS), including possible answers in Arabic and Russian (and phrases such as “documents must be submitted to file an application” and “refusal for temporary asylum”). Usually around 10-15 people turn up for a lesson, but today there are just five girls. After all, tomorrow is the festival of Kurban-Bayram. There’s no single timetable — teacher Elena Lebedeva, who is trained in pedagogy, begins the lesson with multiplication tables, then everyone reads a text about a boy, in which they have to insert the missing words in the correct grammatical case. “The towel is on the windowsill — so there is a messes in his room,” concludes Nura. “A mess,” Elena Yurevna corrects her. “Teacher?” Gufran raises her hand, pronouncing the Russian word without softening the final “l” as is custom. “What’s a windowsill?” Nine year-old Shahad doesn’t know what the word “everywhere” means. While their elders are engaged, the young girls share green plums among themselves — during breaks Soraya and Nura make a break for a plum tree which grows near the school. Gufran tells me that she and her sisters (Soraya and the younger Nura) have lived in Russia for five years. The older Nura and her family moved to Noginsk even earlier — back in 2011. This school for the children of refugees opened three years later. One of its founders was the Syrian journalist Muiz Abu Aljadail. Initially, teachers’ salaries were paid by the UN refugee agency (UNHCR). However, local authorities actively obstructed the centre’s work: the FMS put pressure on those from whom it rented facilities, and it soon had to move premises. Muiz eventually left Russia. Today, the centre’s work is only possible thanks to private donations. Syrians have lived in Noginsk since well before the war, and generally worked in textile factories (of which there are eight in this city of 100,000). When war broke out in Syria, many decided to stay here for good and arranged for their families to join them. The majority of these people had arrived in Russia on tourist visas, after which they received temporary asylum. Once that period had expired, the migration service told them that they could return home — in the minds of these government officials, the war in Syria had already come to an end. Civic Assistance cites data from the Federal Statistical Service: as of 1 January 2017, only two Syrian citizens in Russia had full refugee status. Some 1,317 had temporary asylum. According to the same body, there are over 2,000 Syrians living in Noginsk alone. Without a clear legal status, the children of refugees cannot receive an education — although they formally have the right. Article 43 of Russia’s Constitution guarantees the right to a free education, accessible to all. Article 78 of the federal law “On Education” addresses the right of foreign citizens in Russia to free pre-school, primary, and secondary education. Nevertheless, in 2017 the RUssian Ministry of Education adopted Order 32, according to which foreign citizens must present documentary evidence of their right to stay in Russia upon enrolling their children in school. This development essentially closed the Russian education system to the children of migrants and refugees. School directors and headteachers frequently interpret the order as meaning that migrants must have the right to temporary or permanent residency in Russia — and refuse to enrol children without it. To make matters worse, pupils are threatened with expulsion when it becomes clear that their registered residency in Russia is drawing to an end. Civic Assistance points out that directors and headteachers often avoid giving written refusals, and instead simply delay enrolment of refugee children in school, citing incomplete documents. Online enrolment, which has been introduced in all Moscow’s schools, is no better: the system doesn’t allow non-citizens without registration to send their children to first grade. In assessing Kurbanov’s appeal on the case of his expelled children, the Supreme Court acknowledged that the practice was illegal. “The absence of the listed documents [such as a registered place of residence or domicile] cannot be sufficient grounds for refusing the enrolment of a child in any educational institution which has free places,” concluded the court. Yet despite this decision, and aid provided by Civic Assistance, school directors are in no hurry to enrol children without registration. Children during lessons in the secondary school of the village of Krasny Desant, in which there is a refugee camp from the south-eastern regions of Ukraine. Photo: Sergey Pivovarov / RIA Novosti. All rights reserved.Arseny Kovpan, an eight-year-old boy from Odessa, didn’t go to school this year. Just like the year before, and the year before that. His family has lived in Russia for three years — Arseny’s father works as a barman, his mother as a hairdresser. His parents are on the migration register, have work contracts, and rent out an apartment. Furthermore, his older sister Yaroslava has already been studying at school for three years — the same school which refuses to admit Arseny. The Kovpan family decided to bring the case to the courts — but first and second instance courts sided with the school. In the words of Darya Manina, an employee of Civic Assistance who reviewed the situation, the main argument of the department of education rested on the expiration of a certain three-month period: Arseny’s parents had appealed to the court more than three months after the school’s refusal. In a Moscow City Court session on the Kovpan family’s case, a representative of the Department of Education insisted that Arseny’s parents first came to the school not in June, as the father had said, but on 28 August — by which time there were no more free places in class. The court dismissed the case against the school, but Arseny’s parents still intend to petition the Supreme Court. That said, they’ve now gone back on the idea of a conventional school education altogether; Arseny and Yaroslava will now study at home instead. 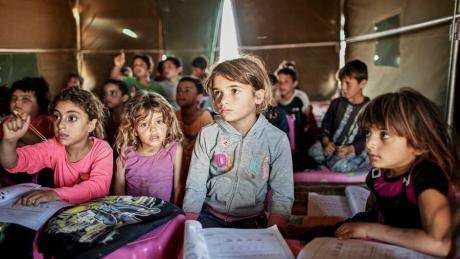 The children of Syrian refugees are no exception to this trend — they’re also not wanted in the education sector. This year only three of them are enrolled in school; the rest must stay at home. The families of Nura and Gufran also received a refusal. Children of migrants, as a rule, exemplary pupils, and parents inspire respect for teachers. Photo: MIA "Fergana". All rights reserved.Nura and Gufran speak Russian well, and take their studies seriously. They always listen to their teacher. But as the sociologist Daniil Aleksandrov puts it, that’s nothing exceptional for the children of migrants or refugees. In a report for the Higher School of Economics on the situation of migrant children in St Petersburg, researchers stated that the main factor affecting progress in education is the age at which they move. If a child moves to a new country before the age of seven, her academic performance will not be markedly different from that of her classmates. Progress in English language, for example, is on average slightly higher among children for whom the Russian language is not native. For example, the average score for algebra among Russian children is 3.5 — for foreign children it’s 3.4. Aleksandrov continues that other schoolchildren tend to have a good attitude towards children of other nationalities. “We asked children without Russian citizenship whether they encountered xenophobia or discrimination. They say that there were some cases — on public transport, on the street — but not a single instance at school.” Stories about frequent conflicts between Russian schoolchildren and the children of migrants are nothing but myths, he believes. Fatima’s mother (one of the three Syrian children who have been enrolled in school in Noginsk) confirms this: “Fatima does clash with other children: she says that sometimes the kids whisper behind her back, but there are no big problems with her classmates.” As Aleksandrov puts it, school is a safe social space for migrant children. A school education, apparently, is not included in these “necessary measures for integration” — foreign parents should presumably educate their children themselves. Meanwhile, Russia continues to provide increased military support to Syrian president Bashar Al-Assad and the self-proclaimed republics in south-eastern Ukraine. The victims of these conflicts will just have to make do.